Do you have a dream that you don’t dwell on long because the idea of it coming true seems so unattainable? I’ve had a dream like that. It’s seeing one of my novels make it to the big screen, and on May 9th that’ll be happening! Well, to clarify, I wrote the novelization of Moms’ Night Out. That means they sent me an “almost complete” copy of the movie, and I wrote a novel from it. Yet even though I didn’t come up with the concept, there so much of “me” in this book. And more that what I gave to the project, I’m blessed by what I was given, too. 1. Sometimes God gives you the desires of your heart even when they don’t look like what you think they do. Writing this book made me feel special. It’s as if God knew how much I’d love this project, and He honored me with it. He showed me He knows my heart even better than I do. He knew what would bring me great joy. 2. Sometimes God uses past struggles to encourage people we’ll never meet. The main characters of Moms’ Night Out are a teen mom, a ministry mom, and an overwhelmed mom. I’ve been all three! How crazy that I was able to share the struggles and journeys of each of these characters, mainly because they were my story, too. 3. Sometimes fictional stories hit our hearts deep. I’m not too proud to admit that I cried in this movie a number of times. Yes, it’s a comedy, but there are also heart messages that hit deep. The most important one is, “Mom, you are enough.” I’m getting teared up just thinking about it. 4. Sometimes you think a project is about one thing, but it’s actually about something else. Yes, I loved working on this book, but the new friends I’ve made along the way are amazing! Because of working on this project I’ve found heart-friends that I won’t trade for anything. (I’m pointing at YOU, Kerri Pomarolli!) I’ve often found that the people I get to work with are a bonus beyond the projects! Have you found the same? 5. Sometimes moms need a break . . . and they just need someone to get the ball rolling for the fun to start. I can count on one hand the number of times I’ve just gone out with mom-friends. After watching this movie, I realized I needed to do this more. I might have gone a little over the top because I’ve rented a whole theater for my girlfriends to watch Moms’ Night Out with me. (A little over the top.) All I can say is that it’ll be great to be surrounded by 148 dear ladies (and a few brave gentlemen). And no popcorn fights, please! Also, friend, don’t be afraid to talk to God about the desires of your heart. Yes, there are some things that seem over-the-top, but I’m discover a God who loves to bless His daughters. Turn to Him with your desires and see what HE can do! What did @TriciaGoyer learn from writing the novelization of @MNOMovie? Find out! 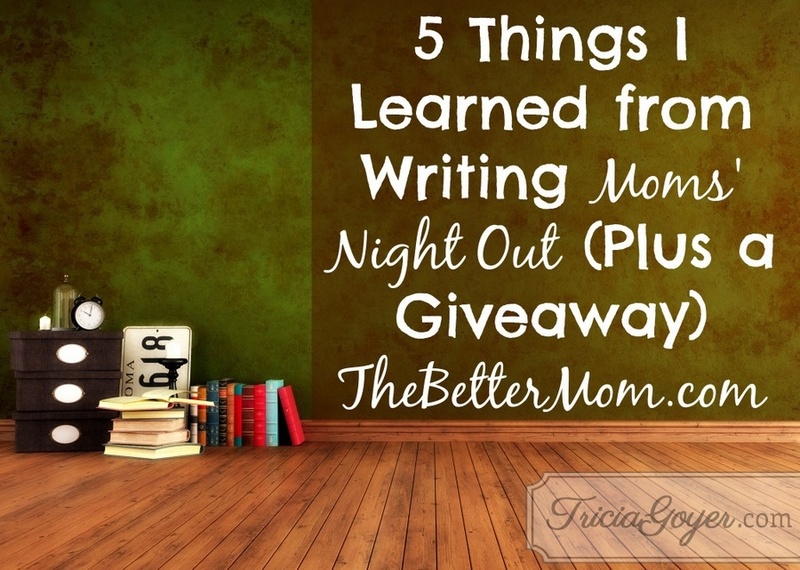 Read the original post, plus other awesome posts, over on The Better Mom! Leave a comment below and tell me about what you’d like to do during a time out with your mom-friends, and I’ll give one person a copy of my new book, Moms’ Night Out! Take a few minutes to call, text, or email your mom-friends! Set a date for your own moms’ night out. Bonus points if you make it to the weekend opening of Moms’ Night Out! Thank you for placing in my heart these desires; I know that wanting to spend time away from my children does not make me a bad mom. It just means I need some time to refresh and recharge. Help me to make time to do this. I would like to go to a museum. Some quiet time with friends plus I will learn something! Oh, great idea! I love museums! I recently was able to go to a local museum with some friends. It was so nice. I just moved to a new state, so I would love to make new friends and memories any way I can! 🙂 I am hoping my husband and I can see the movie. It’s a great movie, Carrie. Let me know if you see it! I would love to go out to dinner and a movie with some friends. Unfortunately, we are all so busy with jobs, kids, sports, etc that we never see each other. So, I will settle for a mom’s night in, in my PJs with a bowl of ice cream and a good book (hopefully this one)!! I already have planned a night out with a friend and her stay at home daughter to see this movie this Friday. I am blessed to have went to a Beth Moore conference this past Friday and Saturday with shopping and lunch out added to the mix with my one of my girlfriends. Love time with girlfriends no matter what we do. Finish a cup of tea while it’s still hot! Going out to dinner with my friends is the best girls night out. It is nice to enjoy a good meal without any melt down by Glitter Bug. I would like an uninterrupted conversation with my friends. A night full of laughter would be an added bonus to anything we might be doing. Would it sound pathetic if I said that I don’t have any mom-friends…well, actually, I don’t have any friends! My husband is my best friend and my life is my family. It sounds great to have some time to go out with you and your girlfriends. If only I had some to go out with! Boy, how pathetic does that sound! LOL I am with my children 24 hours a day seven days a week! There are times that I would LOVE time away, but I really just don’t have anywhere to go or anyone to go with (other than my hubby.) I would love to read this book and see the movie. I tried to get a group of mom’s together to go see the movie, but sadly as it turns out it isn’t playing at any of of our local theaters. So 10 of us are getting together for dinner instead. If I had a chance to get together with some other mom friends…I would just want to relax with a good cup of coffee and talk. I have a huge lack of adult conversation in my life at this stage. I have 4 kids all under 9 and I crave adult conversation. I have seen the preview of this movie and it sounds really great! Anything just to get out of the house 😉 A few months ago, I went out to a nice dinner with a few fellow homeschool moms and no kids. it was wonderful. I also used to do a craft group once a month but lately I’ve had to work 🙁 Maybe a nice dinner at a kidless restaurant. Or maybe dinner and a play, But I’d have to be selective about the title. If I’m leaving my kids at home, I don’t want to be around other people’s kids. Does that make me a bad person? Out with a friend for a walk and then lunch would be lovely. For the past 2 years my 2 daughters, 2 granddaugters and I have gone to the beach for a week. We had the best time! We are looking forward to going again this summer! Its a great time of bonding! I would love us to go to the aquarium i love sea animals!! And then head off to a nice dinner with a movie with the mom friends!! I’d love to go on a girls getaway to the beach. I haven’t been to the beach in years nor have I had a girls getaway. I don’t have kids at home any more, but when I did just some time with friends to talk without being interrupted by little ones would have been great. And also maybe a pedicure. I have actually coordinated for some ladies at my church to attend on Sunday night opening weekend. Imam so excited to see it! I have young and old moms alike coming together to fellowship with a great movie and dinner afterwards. This is the stepping stone for further mom outings… Can’t wait. I would like to reunite with my high school girl friends for a weekend get away of just reminiscing and lots of laughter. That sounds like alot of fun. For a mom’s night out I would love to see the movie! I don’t know if I have ever done in mom’s only night out! My daughter is seven and I can’t remember the last time I did something with a friend. Well, it has been a couple months at least. When I get the chance I like to go out with my friends but I have not been to a movie theatre in a long time! So proud for you Tricia. What once was a dream – now a reality. Dreams are nice, but realities are so much better. Right?